First some “watch out” remarks for the solution I came up with. 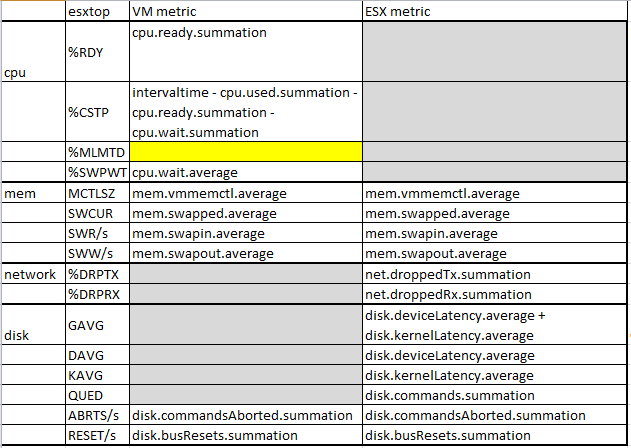 esxtop uses some metrics that are not available via the Get-Stat cmdlet. The script doesn’t aim to replace esxtop to pinpoint potential problems. esxtop uses a 5 second interval. The Realtime interval with 20 seconds is the shortest available and Historical Interval 1 is even 5 minutes. Consequentially short-lived spikes will hardly be visible in the report the script produces. Does this mean the script has no real value ? show you possible problem areas in your environment with a rough indication of the time when they took place. This will help you in deciding when to look at the details with esxtop. From the tresholds Duncan published in his article I will, in this post, only look at the disk-related metrics. First check, can we get all the metrics that esxtop shows ? Yes, we can get most of them. To start with I compiled a worksheet with the esxtop fields and the corresponding metrics. As you can notice, some esxtop fields require calculations when we try to emulate them with performance metrics. Luckily the disk-related values all have corresponding metrics. 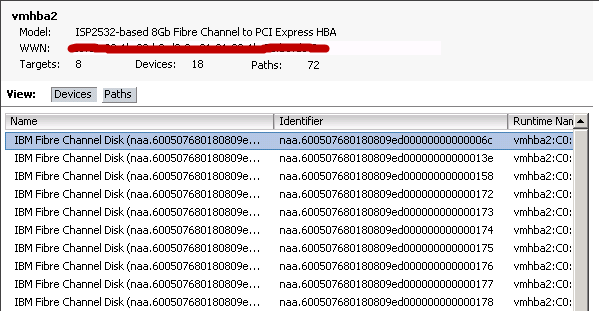 As you probably know most of the disk metrics come with an instance that is displayed in the vSphere client as the Identifier field. If your have multi-pathing, your LUNs/disks can be reached over more than one path. Which path is taken depends on what you defined in the Path selection policy. It can be Fixed, Round robin or Most recently used. In this script I will try to emulate the adapter view. Since the values returned by the Get-Stat cmdlet are per instance, the script will have to add the values of all instances together to emulate the esxtop adapter view. The user should be able to specify the adapter(s) (vmhba2 for example in the screenshot) he is interested in. It is up to the script to find out which LUN instances pass through the adapter(s). Unfortunately the Get-ScsiLun and Get-ScsiLunPath cmdlets, as far as I know, don’t allow you to make the link between an adapter and its LUN instances. That means we will have to dive into the SDK. For an ESX host the HostStorageDeviceInfo object allows you to find these links. It’s a matter of following the links, using the keys and placing all the instances in one or more arrays. As a side-remark, in the test setup I used a “Fixed” Path Selection policy. This is done to show that different instances (devices) can have a path over different adapters. In reality I normally use the “Round robin” policy. The problem with the “Round robin” policy is that all paths will be marked as “active“. That means that the “adapter” concept becomes irrelevant. For example if you run the script with two adapter selected, all the instances will be mapped to the first adapter you specified. Line 10-11: to have any practical value the metrics should be requested from the Realtime interval. Line 38: the reporting array is composed of two nested hash tables. I used hash tables because that makes it easy to find back the entries (by key). The script produces one CSV file per adapter you specified. In the CSV file you see the values for the metrics (same headers as esxtop). Unfortunately I wasn’t able to stress my SAN components sufficiently to show some higher numbers for the latencies and to have some non-zero number in the QUED column. Note that you most probably will have to change the format of the Time column in Excel to see the seconds. To conclude, do not use this to replace esxtop ! But use it to see some trends, repeating patterns…. Get-Stat : 8/22/2014 10:15:27 AM Get-Stat The metric counter “disk.kernellatency.average” doesn’t exist for entity “”. That would make it line 35 in your script. It looks as if the counter is not available for that specific entity in that specific timeframe. Which time period, and hence Historical Interval, did you select ? Is your vCenter set to at least statistics level 2 for that Historical Interval ? also, it doesn’t look like the counters exist when connecting to a vcenter. Get-Stat : 1/30/2012 3:25:11 PM Get-Stat The metric counter “disk.devicelatency.average” doesn’t exist for entity “ltlesxvts15.loutap.loutms.tree”. @Kevin, I’m afraid the Get-Stat cmdlet is a bit flawed for the disk metrics. The bypass is to use the Get-Stat2 function from my Datastore usage statistics post. Get-Stat2 -entity $esx -interval "HI1" -Stat "disk.deviceLatency.average" -instance "naa.600507680280709ed000000000000172"
I’m afraid you have to give an instance with this type of metric. 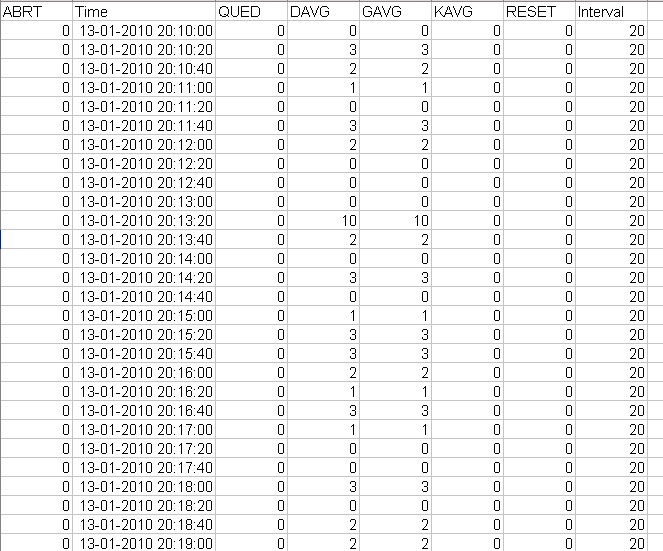 On the vCenter the statistical data is collected from the ESX(i) servers and aggregated into 4 historical intervals. In PowerCLI & vSphere statistics – Part 1 – The basics this is explained in further detail. looks like i can only get data for the last hour no matter what interval i use. is there anyway to get historical data on disklatency? @Kevin, are you perhaps adding the -Realtime switch. The performance data is kept on the ESX(i) for about 1 hour before it is collected by the vCenter. Or are you connected to an ESX(i) server instead of the vCenter ? I am a beginner on Vsphere PowerCLi and I am trying to get the Disk IOPs and latency details of certain VMs. I looked through your scripts. But something is not working for me. $stats has not got anything. I have created all these variables I am supplying to the command. You can start by checking if the Statistics level for the period you selected is set to at least 2. Do you see the statistics in the vSphere client for that guest during that period ? And then start adding the Start and Finish parameter. This is a pretty old post, but have you had a chance to test this against an ESXi 4.1 host? It looks like the metric counters in 4.1 were either removed or renamed. I’m not able to pull any of the metrics specified. This may be a more appropriate post for the PowerCLI community, but thought I’d ask anyway. @Eric, I just checked and all these metrics are still there. Have a look at the Disk I/O Counters page in the vSphere Reference. There must be something else that goes wrong. I’m in a situation that i have to fetch the ESXTOP report for 10 ESX hosts in my environment on every day morning @ 10:00 AM. As of now doing manually but everyday it’s going weird. can you able to help me with providing some script that helps me out from this situation? @Kris, you can get most of the metrics that are available in esxtop with the Get-Stat cmdlet. Be warned that while esxtop collects the metrics in 5-second intervals, with the Get-Stat cmdlet the Realtime interval works in 20-second intervals ! In my PowerCLI & vSphere statistics – Part 3 – Instances post I showed how you can get some of the metrics for the values visible in esxtop. I would advise you to first define which metrics you want in your daily report. An alternative you could consider is to use resxtop. Well, 9 into 0 really as he didnt have to sit there watching the script 😉 Thanks though, your recent posts on statistics are some of the best posts I have read, great detail in a really easy and understandable format. You last post, PowerCLI: Automating traffic shaping on portgroups, is quite amazing as well. A manager’s dream, 9 into 2.